You would think Paraguay would be just like Brazil or Argentina, its neighboring countries due to it’s proximity. But after traveling to Chile, Argentina, Uruguay and Brazil, Paraguay is a different country. We drove in from Iguazu Brazil to Asuncion Paraguay as part of our overland trip which includes Brazil, Paraguay, Argentina and Bolivia and could see right away that the roads were not as well taken care of as Brazil’s. 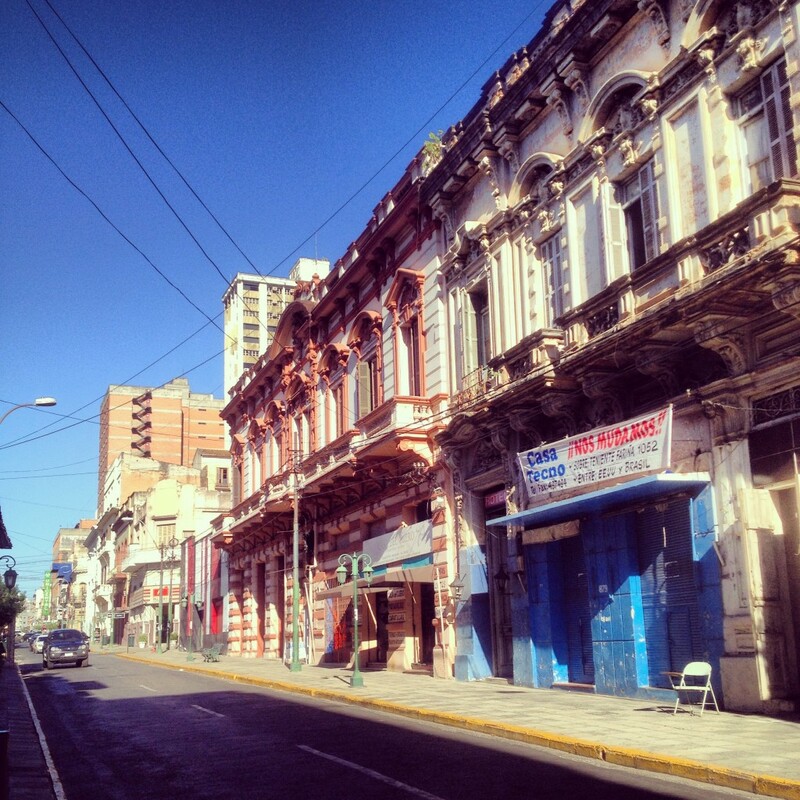 Its capital, Asuncion is unlike any other South American city we’ve been to so far. 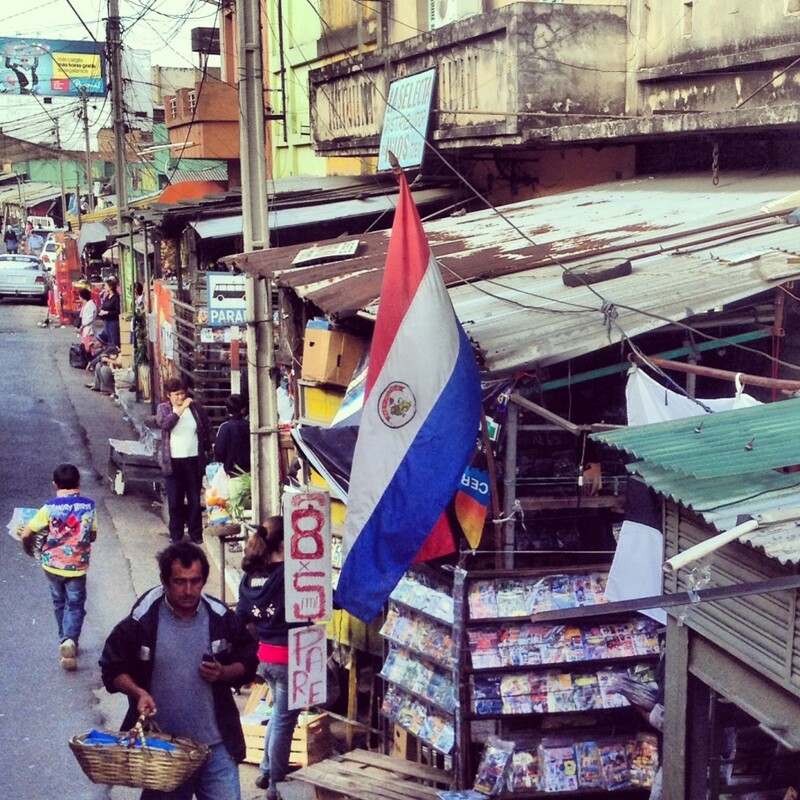 Here’s what we did in a day in Asuncion Paraguay. 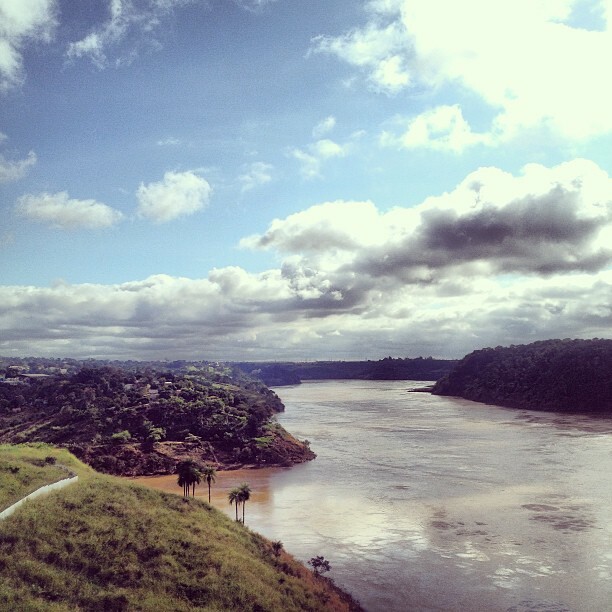 This is the Paraguay River that we crossed to get to Paraguay from Brazil. On the right is Brazil, left is Paraguay. We stayed at the Asuncion Palace Hotel which is located in the history city center and walking distance to the main road in Asuncion. 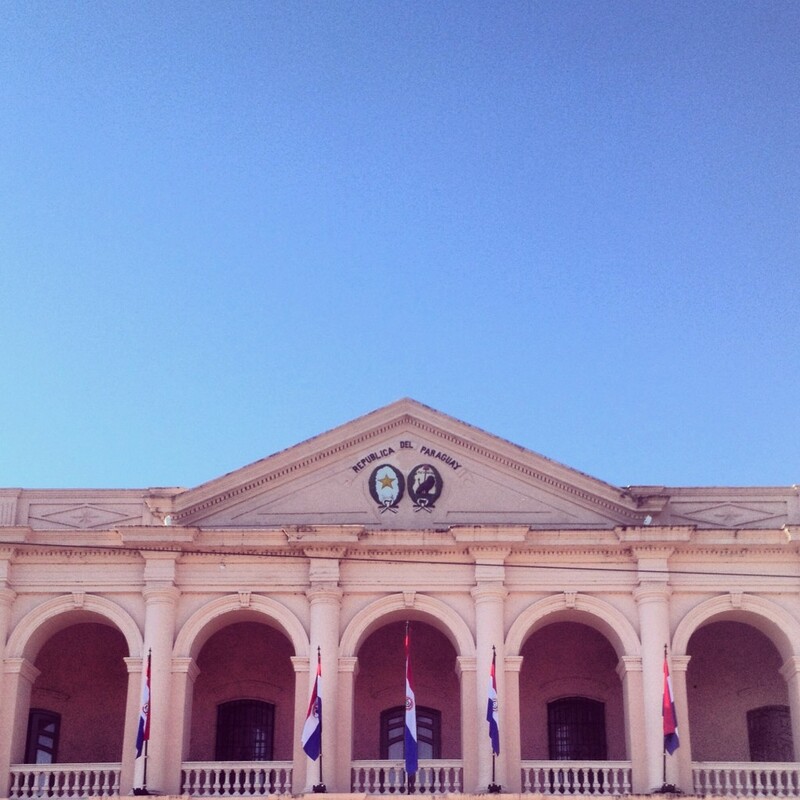 It’s a historical building and used to be home of a Paraguayan president’s brother. The hotel has single, double and triple rooms and there are three floors. We were traveling with a tour group so they booked for my parents to have one room on the third floor, where there are newer rooms, and my brother and I got a triple room with three beds on the first floor. We were taking a camping trip and this bed was the most comfortable bed I had slept in in a while. Our group was going to meet at 10 am to start a walking tour but we got up earlier so we could start exploring the city since we only had a limited amount of time. Breakfast is included in the Asuncion Palace Hotel and starts at 7 am. Breakfast is a typical kind that we’ve had in almost all hotels in South America. You won’t find any bacon and eggs, it’s just toast and jam, fruit (papaya, banana, oranges, pineapple and apples), cereal and some cheese and ham. There was also yogurt at the hotel. 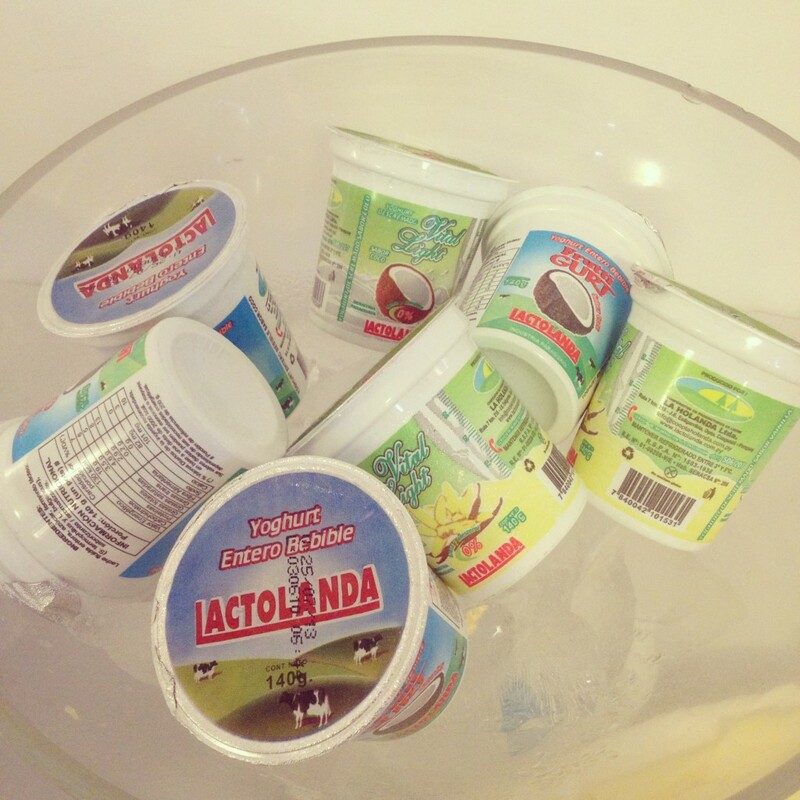 Surprisingly, the yogurt is made in Paraguay! I just thought Paraguay was so small that they needed to import everything. The texture is way too watery, almost like milk. But the coconut flavor was one I don’t see very often. After breakfast we walked a few blocks to where there were some shops selling souvenir type items. This was my chance to speak Spanish again after five weeks of staying in Brazil. I helped my mom buy a t-shirt with the word Paraguay on it since she believes it’s unique… since not a lot of people go to Paraguay. Our tour began at 10 am. 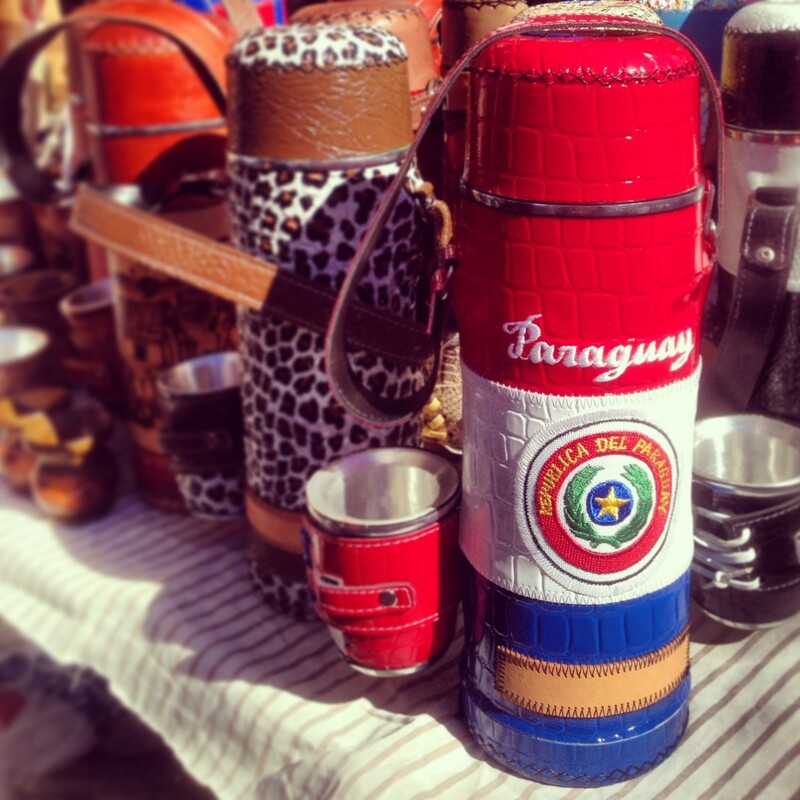 The first thing we saw were some street vendors selling mate bags and gourds similar to those in Argentina and Uruguay. The only difference is the cups are not as round and Paraguayans don’t seem to be as crazy about their mate as Uruguayans. Next, we walked to the main street, which isn’t really very ‘main’. Especially for a capital city of a country. 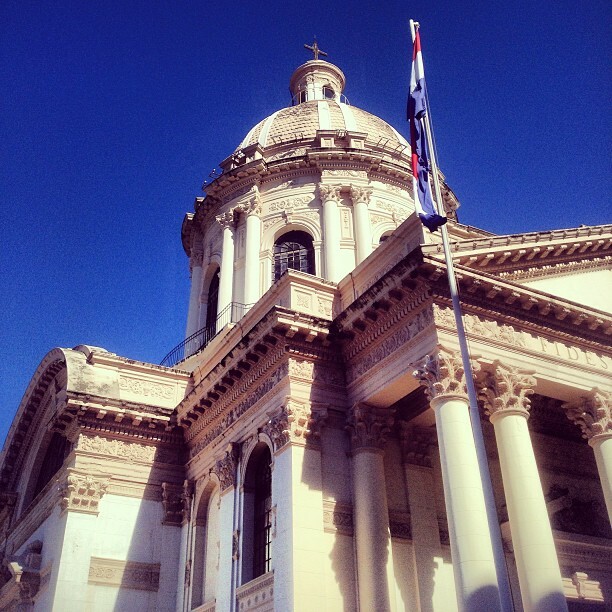 We stopped by Panteón Nacional de los Héroes (National Pantheon of the Heroes) where some important heroes of Paraguay are buried. There are two uniformed guards standing at the door. You are apparently allowed to take a picture with them. Another point of interest was the pink building called Cabildo. 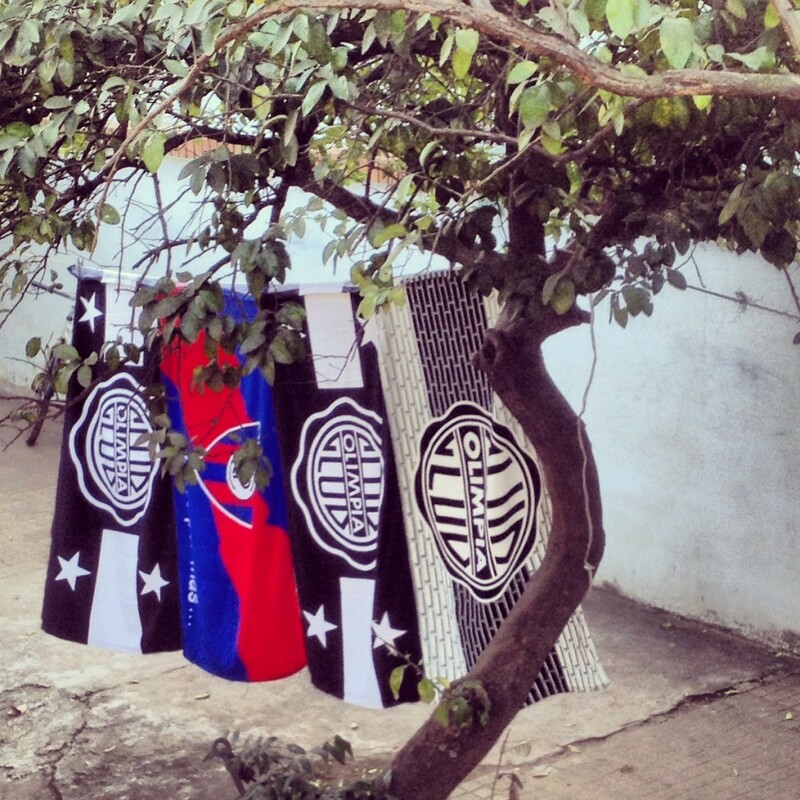 Paraguayans seem very patriotic. Every important building we passed had Paraguay flags hanging on them. For lunch we stopped by a restaurant and sat outside because the weather was nice. Even though it’s winter in July, the weather is still great for shorts and t-shirts. 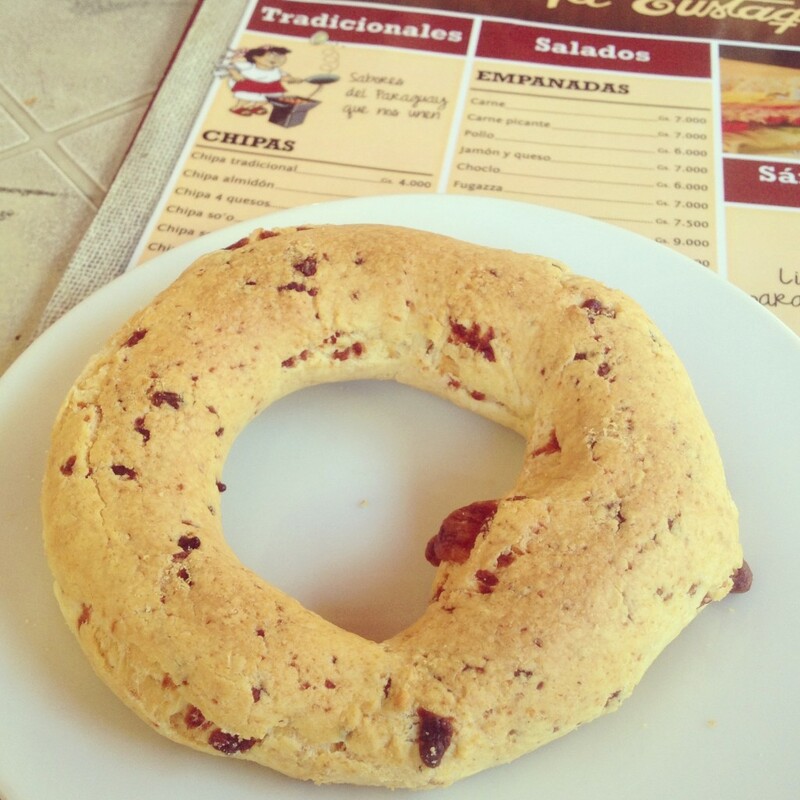 One of the must try foods in Paraguay is called Chipa. It is a corn based bread originally from Paraguay. At the restaurant, it was 4000 guarani (the name of the Paraguayan money and also the name of the indigenous people and second official language of Paraguay). At the time of our visit, 1 USD was 4484.30 Paraguayan Guarani. Here’s a random road with old and colorful buildings on the way back to our hotel. Asuncion Palace Hotel has free WiFi. I would say it had the best internet so far on our overland trip. They have a network for each floor. So we went back to the hotel to get some work done and rest since we’d been up pretty early in the morning. We had dinner at a Spanish restaurant called Taberna Española that’s known for their paellas. For some strange reason that owner wanted us to take pictures with him. So we did. Back to our hotel to pack and get ready for our next long road trip to another part of Paraguay, Trinidad. As Americans we have to pay $160 USD per person for our visas in order to enter Paraguay which I think is a lot of money especially since they don’t even have a ton of tourists. But if you like non touristy type of travel, Paraguay may be for you.